H. W. Brands at the 2012 Texas Book Festival. 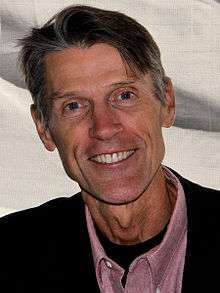 Henry William Brands (born August 7, 1953) is an American educator, author and historian. He has authored 25 books on U.S. history and biography. He is the Dickson Allen Anderson Centennial Professor of History and a Professor of Government at the University of Texas at Austin, where he earned his Ph.D. in history in 1985. His works have twice been selected as finalists for the Pulitzer Prize. While working on his doctorate, Brands taught social studies and math -- courses including world history, American history, Algebra II and calculus -- at Kirby Hall School and Austin Community College. His preferred method of transit was his bicycle as he commuted between classes at the University of Texas and his teaching responsibilities at the college preparatory school on the fringe of the UT campus and ACC's Rio Grande site in Central Austin. In his first year after completing his doctorate, Brands worked as an oral historian at the University of Texas School of Law. The year following he taught at Vanderbilt University. Then, in 1987 he took a position at Texas A&M University, where he remained for the next seventeen years. He made the daily commute from his home in Austin to teach in College Station. In 2005, he joined the faculty at the University of Texas at Austin, where he is currently the Dickson Allen Anderson Centennial Professor of History and Professor of Government. At the University of Texas Brands holds the Jack S. Blanton Sr. Chair in History. Brands is an animated lecturer who presents history through stories. Brands holds that whatever information students may learn in a classroom will slip away with time, but creating an interest in history can result in learning that will continue throughout a student's life. "It is more important to me that my students come out of my class believing 'This story is interesting and I might want to know more about it', than to fill them up with information. If I can remind them or convince them that history is interesting then I feel I have succeeded, because unlike chemistry or physics, history is a subject that anyone can teach themselves, if they are interested." Brands believes creating an interest in history is particularly important in school textbooks, for which he is an author and frequent contributor. "I happen to think it is absolutely critical to write textbooks that engage the students." One textbook Brands co-authored is titled American Stories: A History of the United States, the title of which reflects his view that history is best taught through stories. As an author, Brands views his writings as an extension of his classroom. Initially he intended to write a history of the United States in six volumes, but he was unable to generate interest in a publisher for such a project. Instead of abandoning the project, he chose to come at the task from a different perspective, and set about writing the history of the United States through the perspective of biographies, a genre for which broad interest was well established. Brands' biographical works are really "life and times" stories, with emphasis on the times. In researching an historical period he looks for a character by which he could tell the story of the time, creating through them a voice the readers can identify with. Personal notes and writings, letters and diary entries are all items of great interest to Brands as they allow the period to come alive. "When you tell a story, there are imperatives of structure, of style, of pacing and all of this, that are there simply because you want to make it a good story. When do you introduce your characters? When do you put them onstage, when do you take them off the stage? How do you weave the different threads of the narrative together?" Though the focus in a biography, the subject's life and experience, must necessarily be more narrow than a general history of the time, Brands uses these biographies with the intention of relating the history of the period in an interesting way. One method he uses is to describe the overall events transpiring, then to cut back to the personal writings of the individual. The subject's perception of the world is placed within the broader perspective of the age. Said Brands: "History is a story... in fact, it is the best story I can think of." Examples of Brands' biographical histories include his biographies on Benjamin Franklin, covering the colonial period and the Revolutionary War; Andrew Jackson, covering the War of 1812, western expansion and the conflict over the National Bank; Ulysses S. Grant, covering the Sectional Crisis, the Civil War and Reconstruction; Theodore Roosevelt, covering the Industrial Era and the Progressive Movement; and Franklin Delano Roosevelt, covering the Great Depression, the New Deal, the Second World War, and the ascension of the U.S. as an international power. He takes a progressive view on the nation's founders and the U.S. Constitution, arguing that the founders were at heart radicals who were willing to challenge the status quo in search of a better future. That being so, he believes that Americans today should not be constrained by the views of self-government held by the founders. "In revering the founders we undervalue ourselves and sabotage our own efforts to make necessary improvements in the republican experiment they began. Our love of the founders leads us to abandon and even betray the principles they fought for." He believes the framers would not want the Constitution to be interpreted by the idea of original intent, and believes that we are in error when we view the founders in a "deified" way. "The one thing that [the Founders] did have was an audacity to challenge conventional wisdom." In addition to his works on US history, Brands has works on the economic development of the United States and biographies of key leaders in corporate America. His books are known for their readability and narrative thrust. He has authored twenty-four books, co-authored three others with T. H. Breen, and produced numerous articles that have been featured in newspapers and magazines. His writings have received critical and popular acclaim. The First American was a finalist for the Pulitzer Prize and the Los Angeles Times Prize, as well as a New York Times bestseller. The Age of Gold was a Washington Post Best Book of 2002 and a San Francisco Chronicle bestseller. Andrew Jackson was a Chicago Tribune Best Book of 2005 and a Washington Post bestseller. What America Owes the World was a finalist for the Lionel Gelber Prize in international affairs. The Wages of Globalism was a Choice Outstanding Academic Book winner. Lone Star Nation won the Deolece Parmelee Award. Traitor to His Class: The Privileged Life and Radical Presidency of Franklin Delano Roosevelt was his second finalist for the Pulitzer Prize. He has appeared in the documentaries The Presidents (2005), 10 Days That Unexpectedly Changed America (2006), America: The Story of Us (2010) and The Men Who Built America (2012). His writings have been published in several countries and translated into German, French, Russian, Chinese, Japanese, and Korean. H. W. Brands at the 2008 Texas Book Festival. ↑ "2001 Finalists". The Pulitzer Prizes. Retrieved 17 March 2014. ↑ "2009 Finalists". The Pulitzer Prizes. Retrieved 17 March 2014. ↑ "Frequently Asked Questions". The Pulitzer Prizes. Retrieved 17 March 2014. Nominated Finalists are selected by the Nominating Juries for each category as finalists in the competition. 1 2 "H.W. Brands Biography". BookBrowse. 5 July 2011. 1 2 3 Hollister, Stacy (October 2010). "A Q&A With H. W. Brands". Texas Monthly. Retrieved 19 March 2014. ↑ "LQ Podcast 34: H. W. Brands". Lapham's Quarterly Podcast. 2013. Retrieved 2014-03-03. 1 2 Walker, Tim (13 September 2002). "The World as He Knows It: H.W. Brands' "The Age of Gold" is his 16th book in 15 years -- and he has only just begun". The Austin Chronicle. Retrieved 23 September 2015. ↑ H. W. Brands (2012-08-16). "Hauenstein Lecture: The Cost of Greatness". Hauenstein Center for Presidential Studies. Retrieved 2014-03-10. ↑ Brands, H.W. (September 2003). "Our reverence for the Fathers has gotten out of hand". Atlantic Monthly. ↑ H. W. Brands (2013-03-07). "Hauenstein Lecture: Persona of the Presidency". Hauenstein Center for Presidential Studies. Retrieved 2014-03-12. ↑ Brands, H.W. (2012-11-30). "Don't Dare to Be Great: The Paradoxes of Presidential History". SMU Center for Presidential History. ↑ Vognar, Chris (28 January 2011). "Interview: H.W. Brands writes history for real people". Dallas News. Retrieved 19 March 2014.